Bridging architecture and fashion while leveraging the latest technologies, Simone Simon tailors unique designs for every woman. Simone Simon explores the interface between the human body and the outside world, to create constructed garments using a range of new fabrication methods and performative materials. 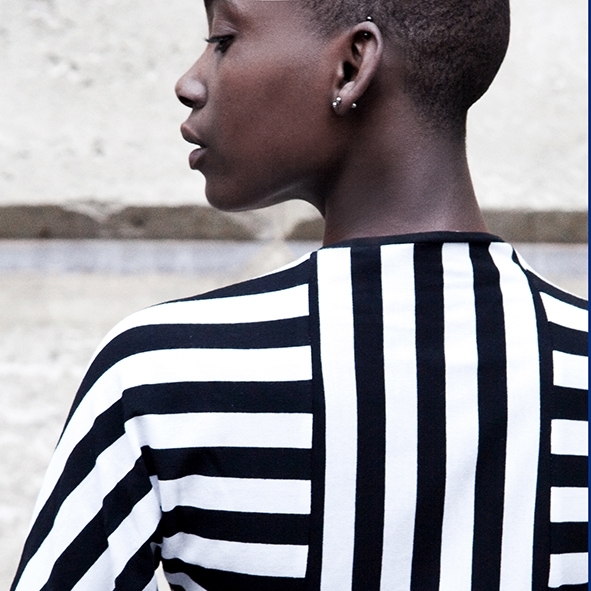 Our first collection celebrates the timeless pattern of black and white stripes, and is designed to honor shapeliness and femininity, as our lines accentuate what you want rather than what you don’t. I want fashion to adapt to women and not women to adapt to fashion. So I create a fashion that adapt to the architecture of the woman’s body. I believe that technologies are changing the way we create, produce, and wear fashion. I also believe in the power of digital parametrical design to create custom-made, user-centered models thereby reducing waste through responsible design. What were you doing before this? How did it prepare you for the entrepreneurial life? I am an architect, and my passion for fashion reflects in Coco Chanel's quote: "Fashion is architecture: it's a matter of proportion". I approach fashion like a construction redrawing the lines between fashion & architecture. I also use my technical background to optimize the apparel fabrication process from creation, to prototyping, to manufacturing. How do you generate new ideas to stay relevant on the market? Is it important to innovate in your space? My first collection was inspired by camouflage techniques (Razzle-Dazzle) invented by the navy forces. Military engineers used black and white lines as a disruptive pattern to camouflage boat. Not to hide but to create and illusion. I used the same visual techniques, only this time to sublime the woman's silhouette. Dressed in Razzle Dazzle, shapes are erased, camouflaged, only to appear at their best, strongest and sexiest, as the design emphasizes waste, shoulders, bottom and bust. Using sustainable materials and local partners is the first thing to do, but innovation is key in fashion on many levels. As the second most polluting industry in the world we have a responsibility to change the way we create and fabricate (thus consummate). Gabrielle Coco Chanel is to me one of the first and most successful international business women of the 20th century. She inspires. What is one thing you find to be true that most people would disagree with? Stripes can be very enhancing, flattering, and feminine. When we think stripes and clothes, we picture the traditional Breton shirt, marinière, with unflattering horizontal lines that don’t work on all shapes. But if you play well with the lines, you can reveal a silhouette and use them to actually enhance body curves .I drew from my background in architecture to rethink stripes! What is your proudest accomplishment of this year? What are you looking forward the most in the next 12 months? Simone Simon was one of the lucky female founder startup in the Babson WINLab’17. We were also recognized this year by Boston Fashion as one of the “new faces that should be on every fashionable Bostonian’s radar”. I moved from Paris to Boston two years ago, knowing the need for fashion brand that represent Boston women interests around the world. I want Simone Simon to be that brand. Just a few days ago, Simone Simon was selected to be part of Project Entrepreneur in NYC! Another opportunity that I am really looking forward to. This spring, Simone Simon will launch a pre-sale for the Razzle Dazzle collection with a fantastic lineup of incredible women Ambassadors: stay tuned!